I don’t know about you, but winter always makes me want to cuddle up. Even when I have to go out and look decent, I would rather just throw on a sweatshirt and be done with it. Drew and I have been going out more than usual this past year. Wait, let me rephrase that. Drew has been making me go out more than usual and has tried to push me out of my introverted ways. I like to stay home on the couch with warm blankets and since I am forced out, I have been needing to find ways to bring the comfort along with me. The initial idea was to make a “dressed up” sweatshirt, and I turned to one of my favorite patterns: Astoria by Seamwork. To dress it up a bit, I wanted to add some embroidery from the Janome Skyline S9 Machine. Oh, I should mention something super exciting! I’ve been asked to be a Janome Artisan! I’ll be keeping the Skyline S9 Embroidery/Sewing Machine for the year and sharing a whole bunch of projects made with the machine, which is an awesome thing because I didn’t want to give the machine up! Seriously, I love this thing! I was a little nervous about this project because I wasn’t sure how well embroidery would work on a knit. With all the stretching of the fabric, I was sure something would pucker and become a mess. Luckily, Anna Maria Horner made it super easy for me to embroider with knits! Her kit comes with three different stabilizers, and following the instructions in her booklet, using two of those layers of stabilizer made this project a breeze! Here’s a little tutorial to make a peplum sweatshirt! Start by cutting out your pattern pieces from fabric. Before sewing the shirt together, embroider the front bodice. Cut enough stabilizer to cover the entire front of piece. You will sandwich your stabilizer and fabric like so: bottom layer – No Show Cut Away Stabilizer, Middle – Front Bodice Piece, Top – Embroidery Topping. On your embroidery screen, you can add multiple designs to the same screen- the editing mode on the machine allows you to rotate, duplicate and resize all designs. At this point, changing the hoop size to RE20a will allow you to embroider half of the bodice at once. By using the ruler guide on the hoop, you can play around with placement and size of designs. I used embroidery designs from Anna Maria Horner (Bird), Embroidery Lace Designs (Flowers) and Combination Design (Swirling Stem). I only used four colors, so the shirt wouldn’t be too overwhelmed with color, the tones give this sweatshirt a more sophisticated look. You can see my left side bodice design below. After completing one side, duplicate on the other side. This is where your ruler guide will come in very handy to get an idea of where your embroidery will sit on the bodice. After completing the embroidery, cut the bottom stabilizer and tear away the top. Also cut threads. The embroidery topping dissolves with steam or water, making clean up a cinch! Follow pattern to attach front and back bodice and add sleeves. Try top on and mark where you would like the peplum to start. I wanted mine to sit at my natural waist, which came to 14″ from my shoulder. Measure the circumference of where the peplum will be sewn. My measurement was 33″. To this length, you will want to add between 20-30″, depending on how full you would like your peplum. Next, measure how long you would like your top to be. To get this complete measurement you will want to add in seam allowance and hem allowance (Around 1.5″). My peplum measurements came to 57″ x 12″. Using the gathering setting on your Skyline S9, gather the length of your peplum piece down to your bodice waist measurement. (On mine: from 57″ to 33″). Make sure your gathering is pretty even- you don’t want it to look too full in one section and not another! Sew the ends of the peplum together with 1/2″ seam allowance, right sides together. Attach the peplum to bottom of bodice, right sides together. Hem the bottom and you are done! You now have an awesome, comfy, stylish top! I wore mine to do a few errands the other day and I felt warm & chic! And these awesome brick walls were from Liberty State Park. I wanted to photograph indoors but my stark white apartment walls weren’t going to work. Drew and I went over to Jersey City and explored inside the ferry ticket building where the ferries to the Statue of Liberty leave. It’s such a cool spot, I can’t wait to go back and photograph. We couldn’t stay long because of other activities but definitely expect more photos from this place. Next Post Trish Stitched Turns 2! Floral Tamarack, Ginger Jeans & Etsy Sale! How exciting to get your hands on the embroidery machine for a bit longer! Such an ingenious idea to add a peplum strip to the Astoria sweatshirt. Stunning, it looks gorgeous and perfect, I love the vibrant colours. This looks so high end, would totally buy it if it is available in stores. Oh wow, that’s so completely awesome! 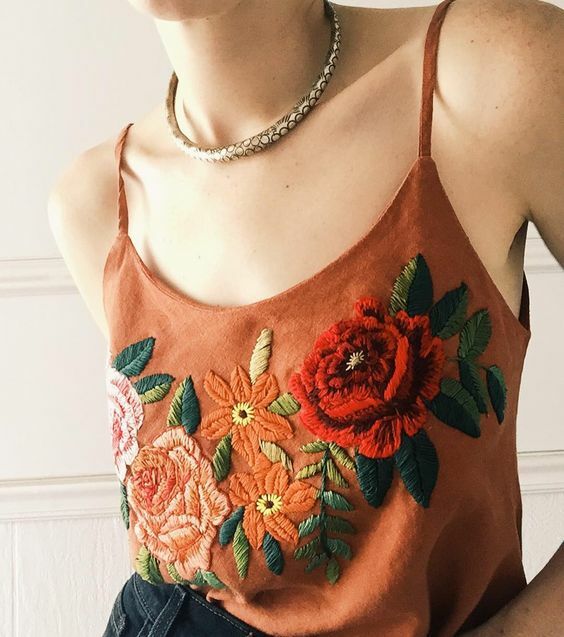 I love the embroidery trend (one of my favorite recent pins is this – https://s-media-cache-ak0.pinimg.com/564x/b0/cb/b4/b0cbb44f29e40590161b0fdd977d18fe.jpg – full swoon) but I don’t have the skills. Funnily enough though I’ve been compensating by shopping for appliques – intended for an Astoria sweater! Love this make! Thank you! There are some beautiful appliques out there, that is a great alternative! !